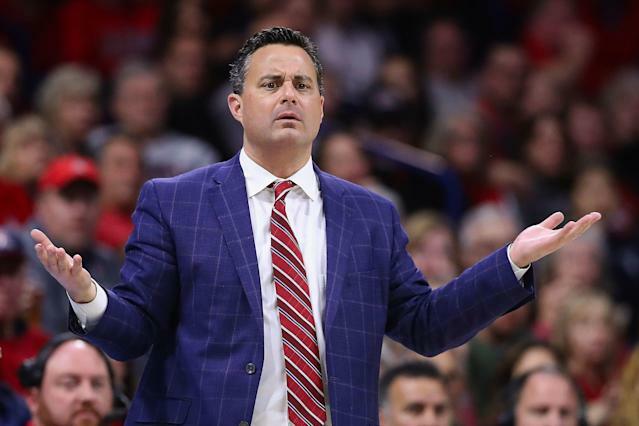 Sean Miller is taking the President Donald Trump approach to questions about alleged misdeeds. Deflect and attack the media. The Arizona head coach has been under scrutiny throughout the FBI’s investigation into college basketball. Miller’s former assistant Emanuel Richardson has already pleaded guilty to federal bribery charges. Another former assistant, Mark Phelps, is gone from the team for a separate academic scandal. And Miller is reportedly known to be on federal wiretaps talking with agent runner Christian Dawkins about a $100,000 payment for former Wildcats center Deandre Ayton. On Monday, news broke that Miller would be subpoenaed for the federal college basketball corruption trial set to start on April 22. This, of course, is a newsworthy development. Miller apparently doesn’t believe that it is. ABC 15 Phoenix reporter Mike Pelton started to broach the topic during a Miller news conference on Tuesday. Before he could get his question out, Miller interrupted him and told him to leave. Miller, of course, is within his rights to “no-comment” every question about the scandal in Tucson. It’s not the first time he’s taken this approach. It serves the purpose of not talking about the issue in public. But with the federal trial approaching, it only delays the inevitable. “No comment” won’t be an option when Miller faces a federal subpoena.